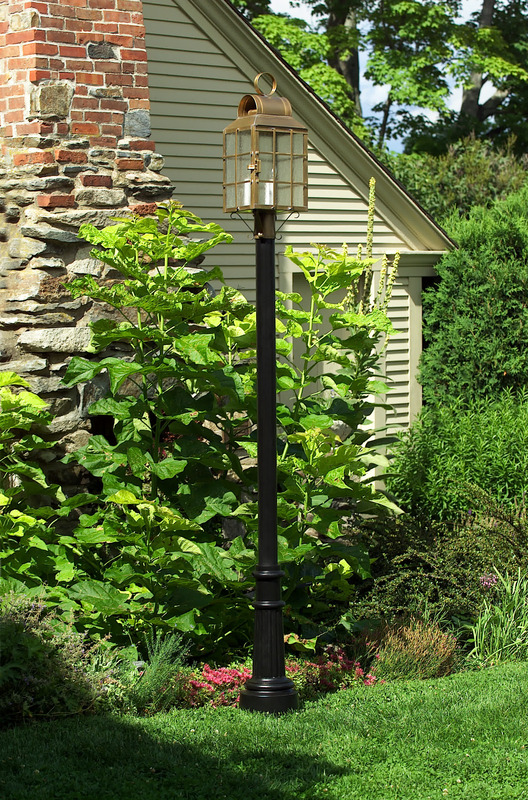 Hammerworks offers this classic “Yarmouth” Aluminum Lantern Pole. First of all it is a practical and affordable choice for displaying any 18th century or 19th century Colonial Post Lanterns. No matter which Cape Cod Style Post Lantern you prefer this affordable yet ruggedly constructed black cast Aluminum Light Post will enhance your landscape project. Furthermore this style allows the classic cast iron look at the most economical price. The two piece base encloses a plain 8 foot tall pole. You can bury the remaining 2 to 3 feet of the pole in the ground. 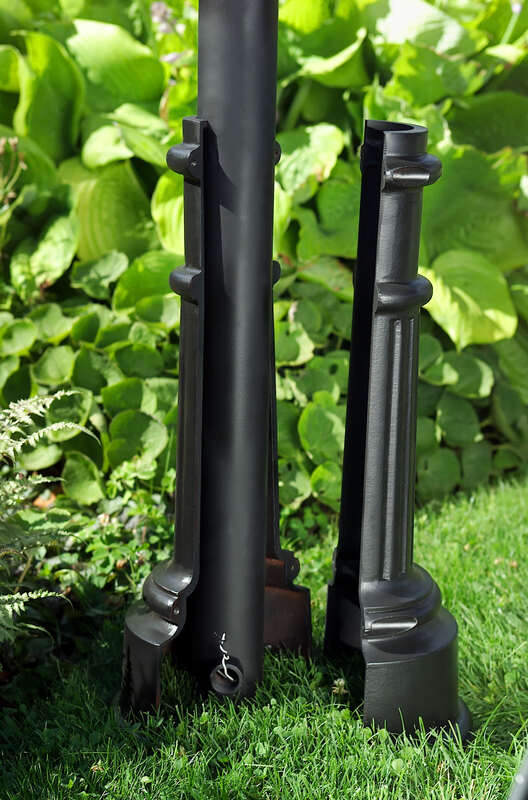 In addition the 3 ” post fitter at the top is the industry standard for mounting your Outdoor Copper Post Lanterns with ease. 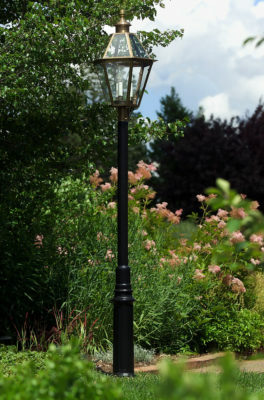 No matter what, when you choose Cast Aluminum Lantern Poles from us you are assured of receiving an affordable yet durable and long lasting product. Especially relevant Aluminum is a softer metal. Therefore it is easily formed to achieve different styles, designs and patterns. In addition any Aluminum Lantern Post is resistant to rust by nature. Finally Aluminum combines both strength and lighter weight, making it an ideal material with which to construct an Aluminum Lantern Pole. 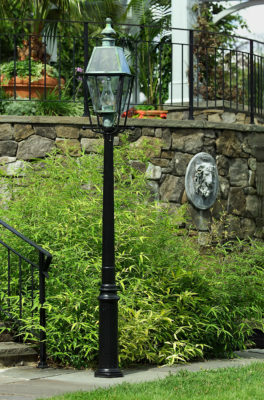 Of course your Aluminum Lantern Pole is not complete until you top it with one of our Colonial Post Lanterns. 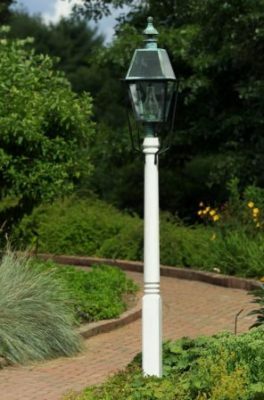 Therefore you can choose from the ever popular Colonial Post Onion Lantern POL12 or the impressive Reproduction Colonial Post Lantern New Bedford Street Light 930BPC. We handcraft each Colonial Post Lantern with attention to detail and historical accuracy. 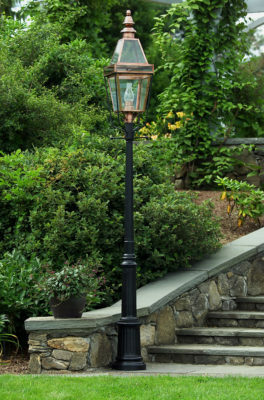 Consequently no matter which of our varied styles you prefer from the Colonial Post Light Williams PW103 to the Colonial Copper Post Lanterns Wills P113 you will always receive exceptional quality from Hammerworks.